Price list for sales scripts and prospecting scripts. Home > About Smooth-talker > PRICE list. Just click on the: "To Purchase" tab in the title bar of the home-page to purchase the scripts. Tip: Save $13.60 in shipping if you purchase 2 scripts. 2 scripts will fit in one shipping box. For Sale By Owner "
Notice Of Default - Short-sale - Foreclosure "
New Agents Training script (covers Expired listings, For Sale By Owner, & Cold Calling/Farming) "
" " " - Call Call & Farming script "
" " " - For Sale By Owner "
Commercial Real Estate Brokers & Agents. Commercial Investment Real Estate - Listing & selling "
Telemarketers & sales-assistants - Listing & selling "
Financial Services - Financial Advisors - Financial Planners. Mortgage brokers and Loan brokers. Insurance Agents - Life, casuality, accident, etc. Business - calling on prospects to sell Products and Services. Business - Prospecting for the sale of SERVICES "
Telemarketers & sales-assistantsfor business sale of SERVICES "
Networking scripts - "Join My Local Referral Networking Group" "
Telemarketers & sales-assistants for Networking "
Note: ... We're sorry but we just can't make Smooth-talker prospecting scripts any less expensive. They are extremely labor-intensive to produce. The scripts have over 80-100 pieces. 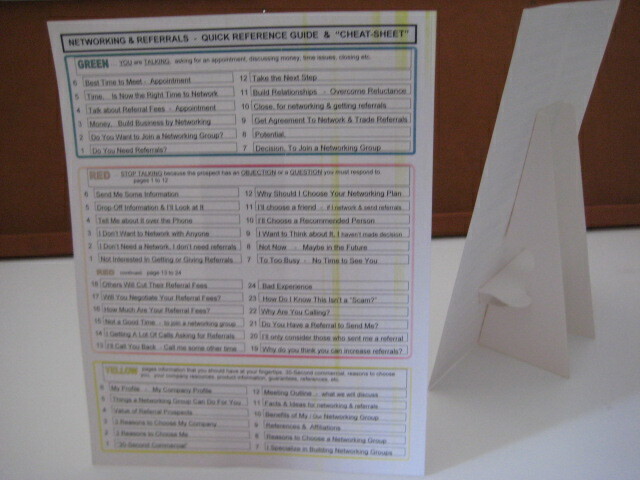 All 60 script pages are printed on heavy-duty colored card-stock. It takes over 50 minutes for the components to be printed, cut-down & hand assembled along with printing the Instruction Manual, making the section-flippers, covers, etc ... plus administrative time & preparing it for shipping. Real Estate Trainers & Sales Managers. script. Includes 4 training scripts and enough material for four new agents. 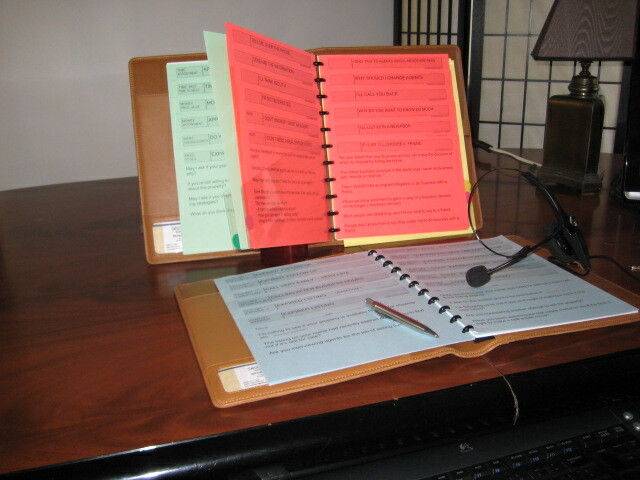 Stand-up Easel Binder - fits all scripts. Makes it easy to view the pages. Designed to withstand heavy daily use. referance guide. It makes it easy to spot the heading you need. Extra pages. $10.00 per 12 pack. 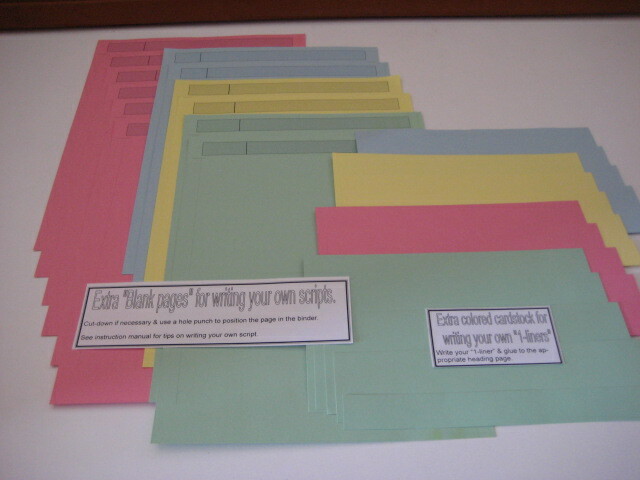 Pack of 12 pages. In Green, Red, Yellow heavy stock. You'll need need them for writing your additional prospecting scripts. Holes are pre-punched. Upgrade to a .. Multi-Ring Binder system. Levenger company is an east coast supplier of high quality products for writers, salespeople, and all business professionals. Check out their catalogue at www.levenger.com View their "Circa" products and also their genuine leather binders, purses, and other gifts. 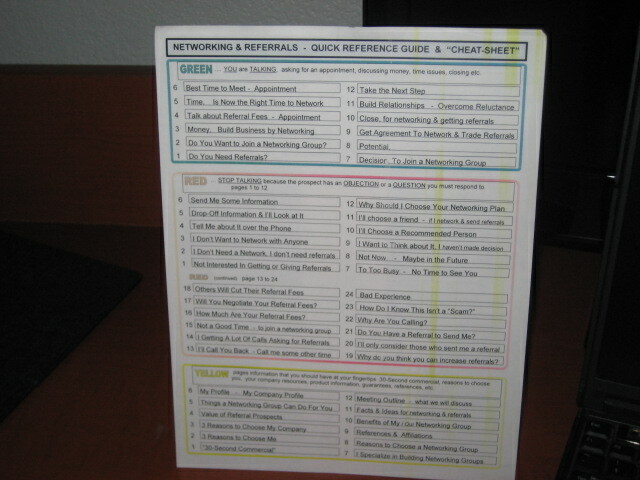 must call about 1,000 to 2,000 potential prospects a month to maintain their book of business. Paper scripts will be shredded in couple of weeks at that rate. 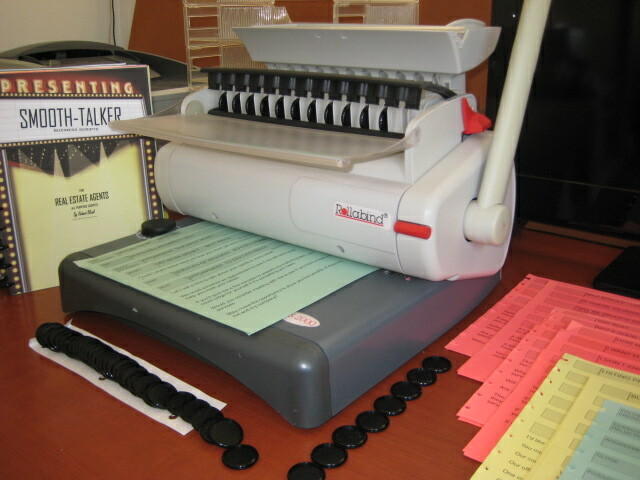 Multi-ring binder system have 11 rings. by such activity. Thats why we print all of our scripts on heavy card-stock. 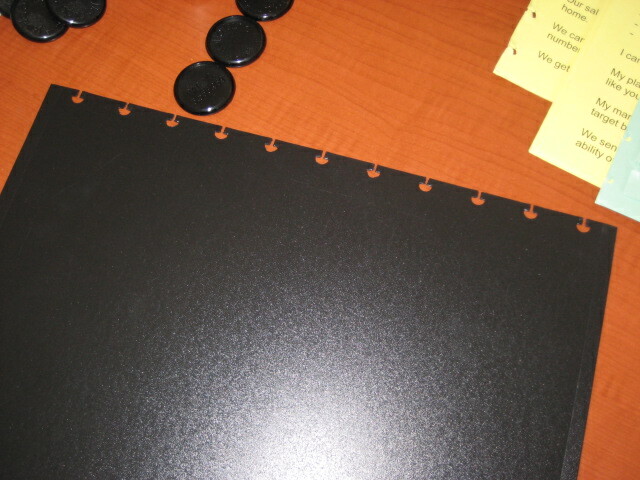 The multi-ring binder uses a special maching for punching the unique holes of the pages. to stand up to ultra-heavy daily use. Deluxe Genuine Leather Binder Cover from Levenger™. 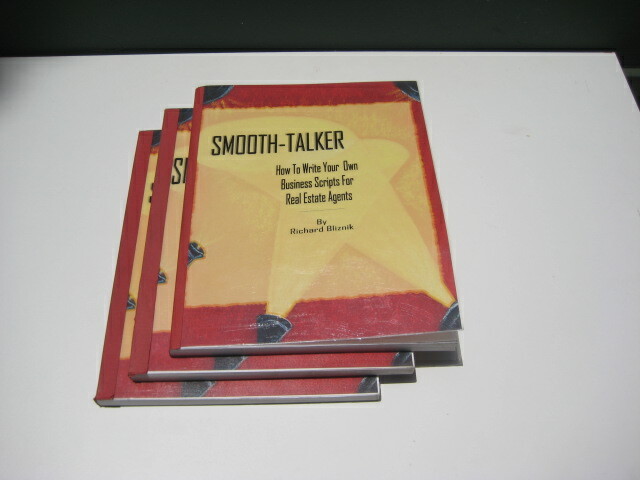 Fits all Smooth-talker prospecting scripts that use the multi-disc system. See their website at: www.levenger.com & go to the "Circa" products. They come with a "velour portfolio-cover" and are gift-boxed. They are so beautiful we just had to offer them to you. We don't make any money on them, we just pass along the cost according to their catalog. 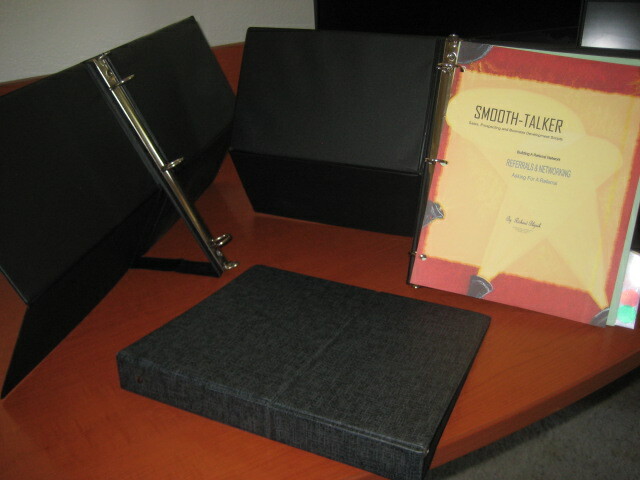 Smooth-talker sales scripts deserve to be treated to beautiful genuine leather script covers. Levenger™. is an east coast company that is a high quality supplier for writers, journalists, and discerning professionals who insist on the best. Designed to make a statement and to last forever. They come in: Saddle, Black, Tan. The most definititive book on how to write a sales script. 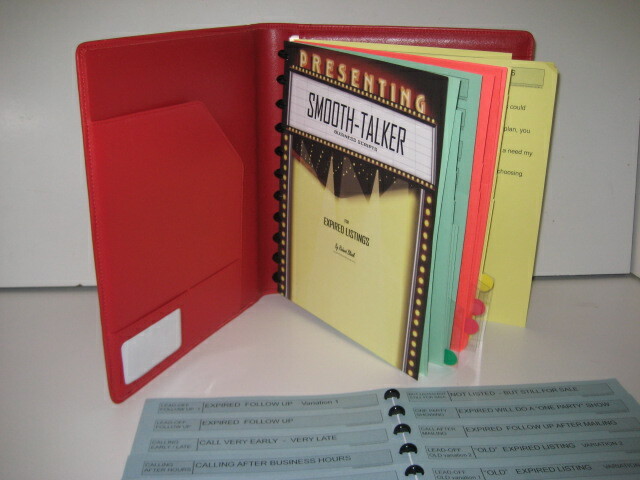 "Smooth-talker, How To Write Your Own Sales Scripts" $24.95 Sorry! The first printing is all sold out. By: Richard Bliznik, author and publisher. Copyright © 2008 Richard Bliznik. All rights reserved. A 212 page book about techniques for how to write your own sales scripts. Packed with tips and techniques, it is your guide to writing a prospecting script that will get you in the door. All-Purpose Sales Script for the new licensed real estate agents. 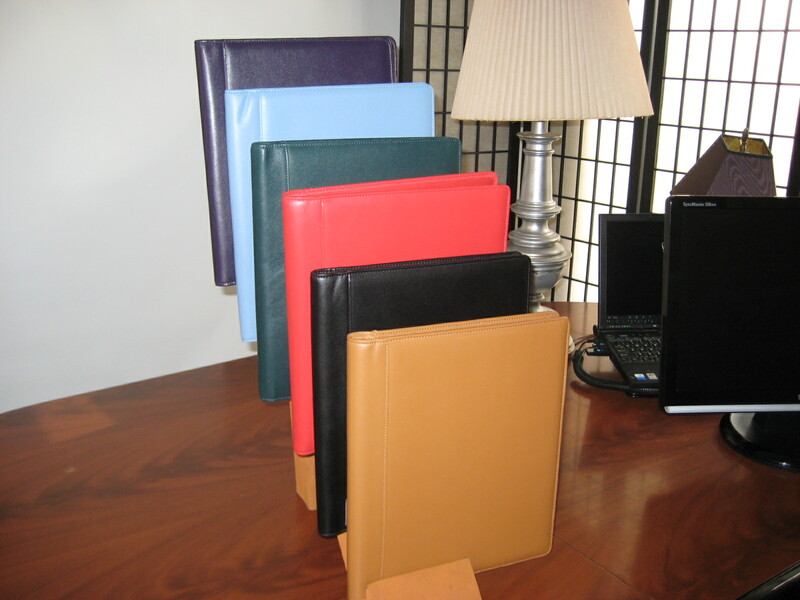 Comes in a beautiful black Leatherette Portfolio with two multi-disc binder systems. 60 pages including 12 pages of Lead-off scripts in another multi-ring binder. 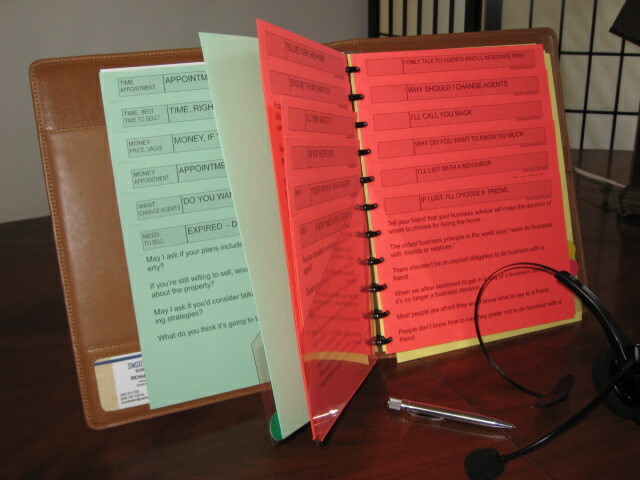 It includes a second multi-disc binder system containing the Lead-off & Sales openers scripts. It has everything that the new real estate agent needs all combined into one script. There is dialogue for Expired listings, For Sale By Owner, and Cold calling & Farming. 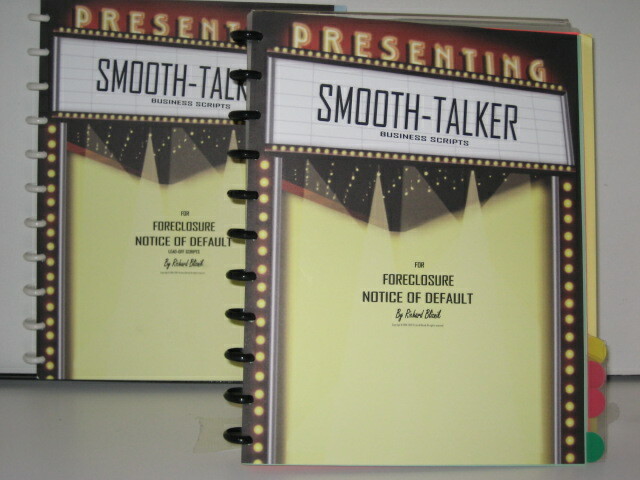 Note: .. Just like all of our quality Smooth-talker script products ... they are cut-down & assembled and include an "Instruction Manual" and more. 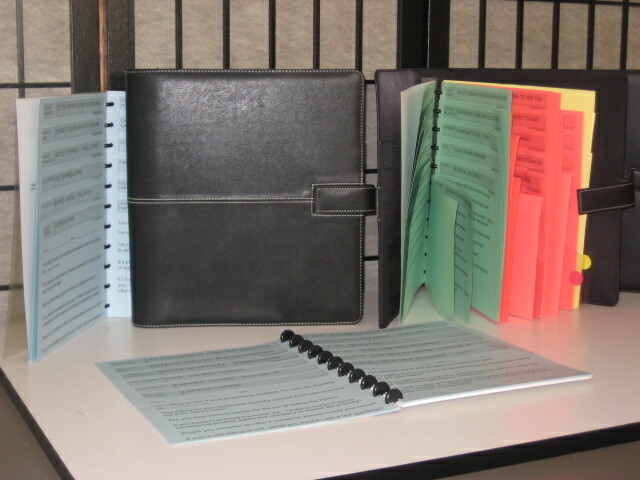 Organizers & Binders from HARTZELL. 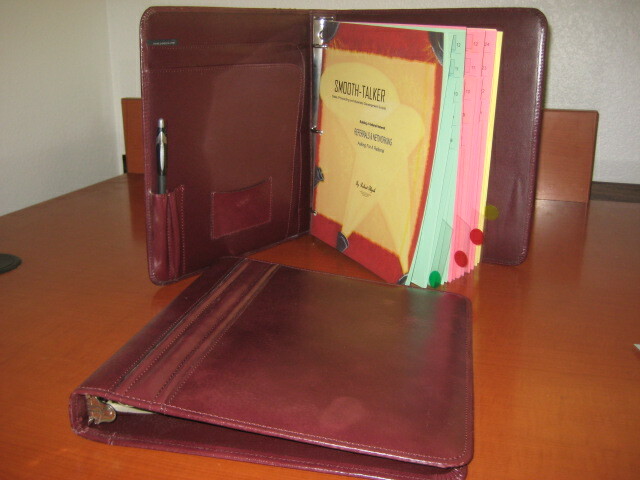 We have a few high quality mult-function organizer 3-ring binders by HARTZELL in Burgandy leather. Originally priced at over $110.00 we want to clear them out for only $29.95 We have approximately 10 of them left as of 3-1-17.